Despite its unassuming looks and gentle temperament, the humble red breasted robin (Erithacus rubecula) boasts a superhero-like ability. They can see magnetic fields, giving them an almost perfect sense of direction. Just to be clear, we don’t mean that a robin can sense the Earth’s magnetic field or something like that as many other birds can, it can literally see it. In fact, if you cover a robin’s eyes with an adorably tiny blindfold, it loses this ability completely, though it will still look rather dapper. Now the ability to sense the Earth’s magnetic field (scientifically known as magnetoception) is an uncommon, but not unique ability in the animal kingdom. For example, we’ve known since 1971 that a homing pigeon’s uncanny ability to navigate is partly down to tiny magnetic particles that were probably in their beaks. The discovery was made by one, William T. Keeton in an attempt to discern how homing pigeons navigated on overcast days, as it had been assumed or suggested up until that point that the pigeons navigated using only the sun, or a keen sense of smell. Though, the possibility of birds using magnetic fields had been suggested and even tested by other scientists up to a century before Keeton’s experiments even took place (more on that in a moment), none of them were conclusive and in some cases they were dismissed entirely. Which is odd since Keeton’s experiments were, arguably, very simple and involved nothing more than strapping magnets of varying strength onto the backs of homing pigeons and jotting down the results. Though his findings weren’t what you’d call concrete, Keeton was able to make a number of conclusions about the homing pigeon. His experiments found that very young or inexperienced homing pigeons needed both the sun and magnetic cues to find their way home. However, more experienced or even just slightly older pigeons could navigate using one or the other. For example Keeton noticed that experienced pigeons were able to navigate in overcast weather without magnetic interference and in sunny weather with it, though the time it took them to get home usually suffered if they didn’t have both references. This effectively proved that a homing pigeon’s amazing innate ability to find its bearings was based on a combination of its ability to sense magnetic fields and the fact they seemingly know how to navigate using the sun, like tiny feathery Bear Grylls. It would take till 2004 though for scientists to conclusively prove that the homing pigeon’s beak was the source of its power, specifically tiny iron particles found there. To accomplish this, researchers in the University of Auckland placed homing pigeons in a tunnel with food next to a strong magnetic coil at one end. After discerning that the pigeons were indeed able to find the food when the magnetic coil was switched on, they then set about impairing a given pigeons ability to use its beak. Though they proved that strapping tiny magnets to a homing pigeon’s beak was enough to impair its ability to sense a magnetic field, to really make sure they even went as far as cutting the trigeminal nerve in some pigeons. Though cruel, it did once and for all undeniably prove that homing pigeons use their beak to sense magnetic fields. As amazing as that ability is, however, the robin wipes its cloaca all over just merely “sensing” a magnetic field and as mentioned, they’re able to literally see it. If you’re wondering how we know this, it’s because somewhere out there, there is a scientist who spent years strapping tiny eye patches to baby robins and seeing what would happen… seriously. As noted in the Discovery Magazine article, Masters of Magnetism, a couple decades before people were experimenting on homing pigeons to discern whether they used magnetic fields to navigate, a biologist in the late 1950s had already come to a similar conclusion about robins. That biologist was Hans Fromme, who noticed that his caged robins, despite being unable to see the sun in the windowless room he kept them in, tried to escape their tiny prison in the same direction whenever their usual migration season occurred. Since the birds were unable to see the sun, Fromme was forced to conclude that they were able to sense which direction they needed to travel another way. Fromme suggested that the little robins were able to somehow sense magnetic fields, in keeping with a theory biologists had held for a while that birds had an inbuilt compass of sorts, but he never bothered testing his theory, or if he did, he didn’t publicize such experiments. 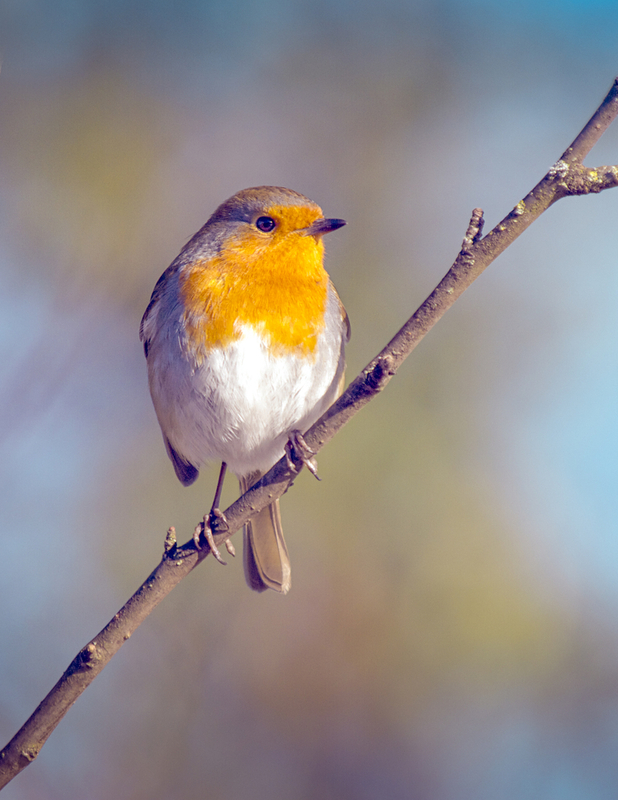 The Russian zoologist Wolfgang Wiltschko, on the other hand, did, and in 1966, Wolfgang discovered that tiny little robins could be lured into changing the direction in which they tried to escape by magnets. Despite his amazing discovery, it was quickly derided and dismissed by the wider scientific community, as Wolfgang’s own wife and fellow zoologist later put it. You don’t want a stupid little bird doing something you don’t do. In other words, the idea was dismissed simply because scientists didn’t like the idea of animals being in possession of an ability us humans didn’t have access to. This didn’t stop the Wiltschkos, though, and they continued to study the effect for many years, eventually realising that in robins, the ability is based primarily on their vision, more specifically, the vision in their right eye. For example, they discovered that giving a robin a eye-patch on its left eye in no way affected its ability to sense magnetic fields; an eye-patch over their right eye, however, did. Will Handling a Baby Bird Really Cause the Parent Birds to Reject It? That is NOT a picture of a Robin: http://en.wikipedia.org/wiki/American_Robin I dunno wtf that is, but it’s most definitely not a robin. That’s amazing. I too was thrown off by the picture. So American robins and their European counterparts are not in the same species? I assume the spring heralds in my back yard don’t share the same super vision as the European robins . . .
American robins are thrushes and are named after the European robin because of the red (orange) breast. One thing about the article…humans do have the ability to detect magnetic north. Apparently, the sheer number of blood vessels in the nose allow for a very small magnetic sensitivity that some can feel. I read some dogs that spin before they crap are aligning themselves north/south. People can see magnet fields also I think. They have to be pretty strong. I was laying in bed with my eyes closed trying sleep when I noticed green waves moving across my sight. I was next to a fan blowing air and realized it was the magnetic field of the fan motor because the waves moved in cycle with the sound of the motor and went away when I turned the fan off. Ah! But would the air velocity be different for a coconut laden robin vs a swallow? This article is very interesting and I enjoyed reading it. However, I must say that I’m confused about “eye patches” put over a bird’s eye blocking magnetic fields. That isn’t possible unless it’s some kind of ferromagnetic alloy (in which case it may distort the field, causing the bird some sort of disorientation). Non-ferrous substances do not block magnetic fields and should have no effect on the bird’s magnetic perception. I wonder if these patches contained iron. I found out I was red/green colorblind when I was 10 years old. I am pretty sure I was born colorblind. My sister knew long before that. When we used to color as kids she noticed I was calling green brown and vice-versa. Anyhow, green has always been a greyish color to me; nothing special like blue or yellow. I once, very foolishly, ate too many hallucinogenic mushrooms (blue ringers) and ended up in the hospital. My dad, who has green eyes, was there beside my bed. I have a very vivid memory of looking into his eyes and noticing just how green they were. They were a color green that I had never seen before, and still have not seen again to this day. It was a terrible way to experience such a thing, but it is something I will never forget. That was over 10 years ago. Despite my horrible experience of ending up in the hospital, I have taken mushrooms a few times since, but without the same result of seeing new colors. Although, I was much more tame in the amount of mushrooms I ate, and I also had a different kind (cubensis).